Scones are a very English thing. The German translation for scone is English tea roll, or something along those lines. The English people have with their afternoon tea. This tea session is not to be confused with the supper or dinner that the English also call "tea" sometimes. At the scones tea session you actually have a cup of the same and a scone. Everything understood so far? For some reason, I never came across scones when I lived in England as an au-pair girl. Perhaps afternoon tea wasn't big in the family I stayed with. Apparently they have it with something called clotted cream.... not sure what exactly that is. It's probably only available in England. Anyway, here in Dubai they also have scones. I like them, as you can bake them sweet or not so sweet and then add butter jam or honey. Until this morning, I actually never thought of making them myself. When I came across a couple of scone recipes I wanted to make them. 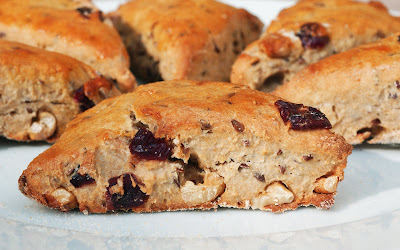 I threw a few recipes together and out came some lovely cranberry walnut scones. I had them straight out of the oven, while my visiting sister had them with butter and honey. They were really tasty and I just love the fact that he whole thing is actually a healthy treat. Put flour, oats flax seeds, baking powder, salt and spices into a food processor and blend. Add coconut oil and honey. Pulse until the mixture becomes crumbly. Pour the buttermilk in a constant stream into the food processor while pulsing. Mix until just combined. The dough should be sticky. If it is too dry, add more buttermilk, by the tablespoon. If too liquid add a little flour. Transfer dough to a well-floured surface. Knead in the dried cranberries and chopped walnuts. Make a ball ourt of the dough and pat it down to a circle, about 1-1,5 inches high. Quarter the dough with a knife, then curt each quarter into halves. Transfer scones to the baking. Keep them 1-2 inches apart. Brush scones with beaten egg. Bake for about 25 minutes or until golden brown at the edges. Serve hot or at room temperature with butter and honey/jam or sweet butter.